Listening to crickets, gazing at fireflies, swatting at mosquitos, poking at glowing embers, and letting yourself get lost in the flames. I have some of my best thoughts by a bonfire. I don't know what it is about them that makes everything seem slightly magical, and somehow safe, but it really pulls at you. People open up to each other, find the courage to sing, run off into the darkness at random until they're lured back by the enticing crackle of the fire and the smell of burning marshmallows. By the end of the night I'm always filled with a strong sense of serenity, and I don't always realize that something bad has happened until the next morning. Texts come pouring in about who did what, there are missed 2 AM phone calls, and a plethora of indirect facebook statuses. Just like that the magic is disgruntled. You wash the smoke and bug spray out of your hair and you deal with the inevitable drama that people create. I hate how things get ruined. Summers are built up to be these perfect streaks of warmth and happiness, but it's still real life. You don't do anything unless you plan it, you don't get a boyfriend unless you actually want to work at a relationship, you don't have money if you don't you get a job, and to-do lists just don't do themselves. That may not be the best of ways to start a post, but it's honestly where I'm at right now. I'd like to tell you that things have been running smoothly since I graduated and am getting ready for college, but that'd be a lie. But it'd also be a lie to say that I'm unhappy. Yes, crap happens. That will never stop. But it's all about how you look at it. I'm very guilty of trying to take the world on my shoulders, and it never ends well. I like to think that I'm getting better at letting things fly by. I don't know what I expected from my last summer before college, but it's been unlike any other I've experienced so far. I haven't picked up a book since maybe April, I can count on one hand the things I've baked, and you yourself know just how much I've been posting here. I guess I'm not sure about a lot of things right now, but I'm figuring it out. 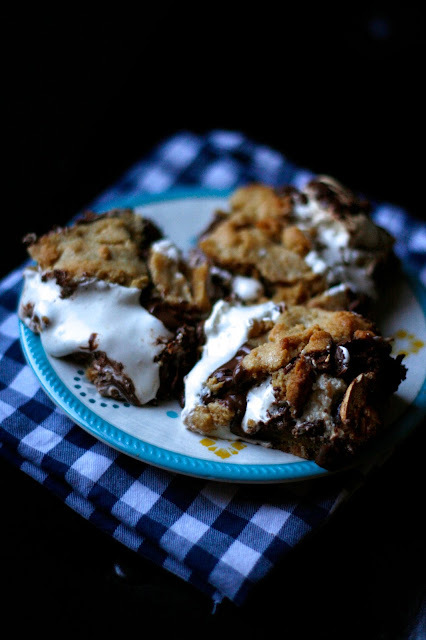 What I do know is that I still friggin love s'mores. And even though it took an ungodly amount of motivation, I fixed up a pan of irresistible gooey summertime. And I know that when I focused in on that melting glob of still-warm marshmallow cream, I remembered just exactly why I do this. I get on here and share with you guys the most recent thing to be concocted in my kitchen, I ramble on in a way that helps me sort out my thoughts and let you know where I'm at, and then we both leave with the satisfying image of something delicious, and just maybe some gumption to go and make it for the first time/again. Again, crap happens. But just because everyone around you is making a big deal out of nothing, that's no good reason for you to not enjoy a decent s'more. 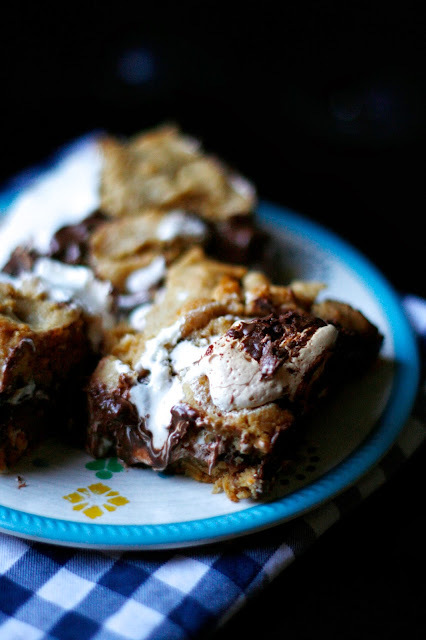 I've made these bars a couple of times, and just recently decided that peanut butter would be a stellar edition. I'm glad I finally took pictures, because they really need to be shared. You can sit back, catch a whiff of the smoke still lingering in your hair, and with each bite recall the stillness of a bonfire when you were unaware of anything but the warmth of the flames and the stars in the sky. 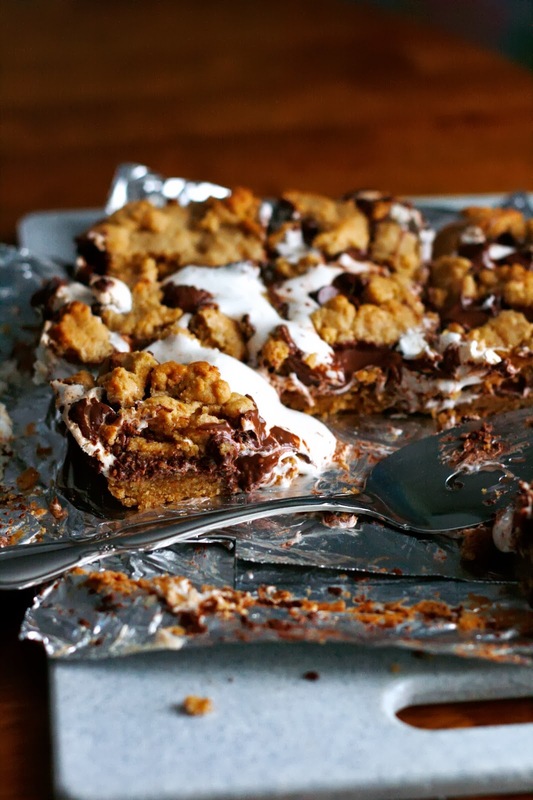 Preheat the oven to 350 degrees and line an 8×8″ baking dish with foil. Spray the foil with cooking spray. In a medium bowl, whisk together the flour, graham cracker crumbs, baking powder, and salt. In the bowl of an electric mixer fitted with the paddle attachment, cream the butter and brown sugar until light and fluffy. Mix in the egg and vanilla until well combined. Add the dry ingredients on low speed until just combined. Press half of the dough into the bottom of the prepared pan. Warm up the peanut butter in the microwave for about 30 seconds, until it's thinner and easier to spread. Spread evenly on top of the dough. Dollop on the marshmallow creme and spread evenly. 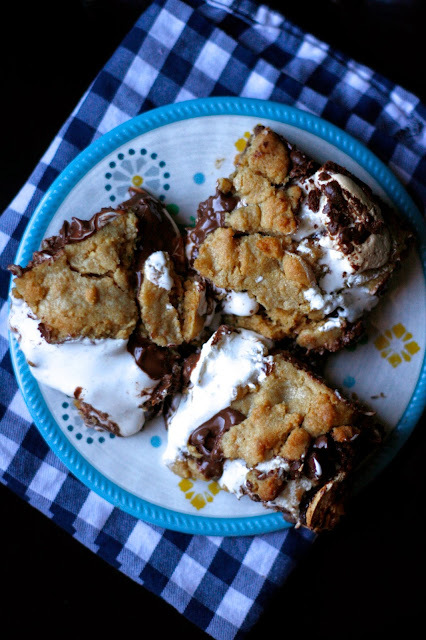 Warm the nutella as well for about 30 seconds, then spread on top of the marshmallow creme. Sprinkle the chocolate chips over the nutella. 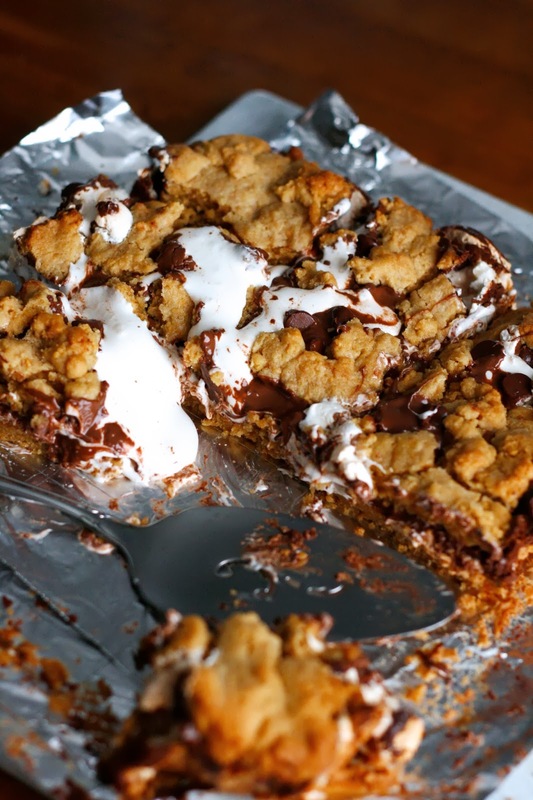 Scatter the remaining cookie dough in large chunks on the top, this leaves some crevices for the marshmallow creme to seep through while baking so it gets nice and toasty. Bake for 25-30 minutes, or until golden brown. Let cool completely before removing from the pan and cutting into bars.